We launched this feature in order to let our members get more from their art and let the world know that metaverse and virtual art is more than a simple form of self-expression - as we all know - it's a new and incredible form of art. This is what we think about it, but what's you thoughts on this topic, do you think that metaverse/secondlife/virtualworld art is a true art genre? or not? For me virtual art from SL and virtual worlds is a true kind art genre. But.....what is about rights and licenses? Is it allowed to sell pictures we take in Second Life? ChewieSmith, I would think .png but it would be interesting to hear what Bigoom suggests. I have put ten photos on Bigoom...and it says as a basic user I can't upload anymore. Ten is the limit?? yes the creator of contents (in SL) retain their copyright and ownership but don't we have to get a licence for the stuff we take a photo of (sims, buildings, hair etc - I know that would be nearly impossible but there are so many nasty lawyers in the world;-) ) if we want to sell that picture as a print or whatever? In answer to the question at the top of this page the answer is no. The reason I have joined this group is to find a way of deleting the account I made with Bigoom before finding out I can't use it. There seems to be no instructions on how to do this on site and a pretty useless 'contact us' page that has no contact e.mail address. Suggestions appreciated. Hi Paul, to delate your account on Bigoom just write us an email (you can find it in our contact page) with your registration address. Why we cannot browse others' artworks in Bigoom? but if we want to sell pictures, people must be able to LOOK at the pics - but I do not see a way there at Bigoom where to do this even if I am not locked in. So how can people buy pictueres they cannot look at???? interesting - no answer here...............where can we look at the pictures that are sold??? Or...where are the pics sold? I surely will not offer pictueres for selling if I do not know where I can buy them! And the question about the licences and if we have the right to sell pictures with content from SL is still not really answered - for me it is not. Hi MarliaLooming, sorry for delay! 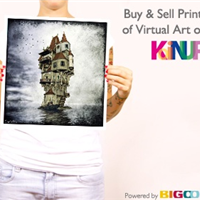 I can aswer you just about your first question: off course people must be able to see what they want to buy...that's why here at Koinup under the photos you want to sell people will see the "buy print" botton. Thanks to our partnership Koiunp become the gallery for photos you want to sell. Moreover if you want to sell your images also in other space (on Facebook, Twitter or wherever you want) you can use Bigoom's share bottons (in the share & embed panel on Bigoom). thank you pier - sorry that I have difficulties to understand all these rights.